Those enduring Premenstrual Syndrome (PMS) can suffer with multiple symptoms including mood swings, depression, irritability, fatigue, tenderness, weight gain, insomnia, cramps, headaches and food cravings. Health professionals agree that healthy lifestyle strategies combined with supplements can effectively help manage and reduce PMS symptoms. 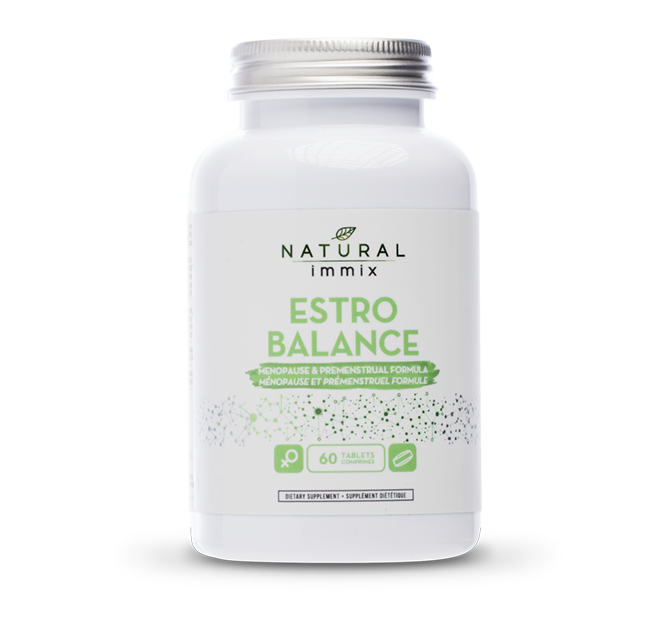 Estro Balance is a unique natural remedy that can help manage the symptoms that often accompany hormonal fluctuations from the start of menstruation through till menopause. Soy: contains Isoflavones, which are powerful plant substances chemically similar to the female hormone estrogen. When the body's natural levels of estrogen drop, Soy Isoflavones can compensate by binding to some of the cell receptor sites that estrogen once did. Menopausal symptoms improve as a result by reducing the frequency and severity of hot flashes and other menopausal difficulties. Furthermore, the phytoestrogens in Soy may help to offset the action of the body's natural estrogen, which is often responsible for pain, heavy bleeding and other symptoms. Black Cohosh: is a herb native to North America that has traditionally been used in Herbal Medicine for cognitive and inflammatory conditions, but has grown in popularity due to its ability to treat vasomotor symptoms of menopause; primarily hot flashes and night sweats. It is used in Herbal Medicine to help relieve premenstrual symptoms and symptoms associated with menopause. Red Clover: tends to refer to the plant known as Trifolium pratense which is most well known for its content of Biochanin A, an estrogenic Bioflavonoid. It is used as a dietary supplement for menopausal symptoms since dietary Isoflavones in general (usually from Soy) are correlated with reduced hot flash symptoms and Biochanin A can convert into Soy Isoflavones. It may reduce severe and frequent menopausal symptoms such as hot flashes/flushes and/or night sweats. It also helps to reduce bone mineral density loss in post-menopausal women when used in conjunction with calcium and vitamin D.
Dong Quai's: reputation as a female tonic rests largely with its ability to reduce the symptoms of PMS and regulate the menstrual cycle. Women have used it to treat amenorrhea (irregular or absent periods) and menorrhagia (heavy bleeding or prolonged periods). The herb's long-standing popularity for reducing menstrual cramps has been ascribed to its anti-inflammatory and antispasmodic actions. Dong Quai treats not only menstrual irregularities but, also the symptoms associated with the menstrual cycle. Dong Quai helps reduce the frequency of migraine headaches during the menstrual cycle as well. Chasteberry: is a supplement derived from berries and is primarily used today to alleviate the symptoms of premenstrual syndrome. Studies have shown Chasteberry to be effective at reducing hot flashes, bloating, irritability, sleep disturbances, depressions, various mood disorders and even cramping associated with premenstrual syndrome. It acts similarly to dopamine, by reducing prolactin levels, which are elevated during premenstrual syndrome. It may also act on the opioid system by releasing beta-endorphins, something the human body lacks during premenstrual syndrome. Licorice Root: contains vital phytoestrogens that have a mild estrogenic effect, making the herb potentially useful in easing certain symptoms of PMS, including irritability, bloating and breast tenderness.